Get real-time news and investment research about the companies and markets you care about. Whether you are looking for broad financial news on markets and economies or granular news on company earnings, FactSet news and research offers real-time news on the factors that affect markets and research that pulls in data from many trusted sources. 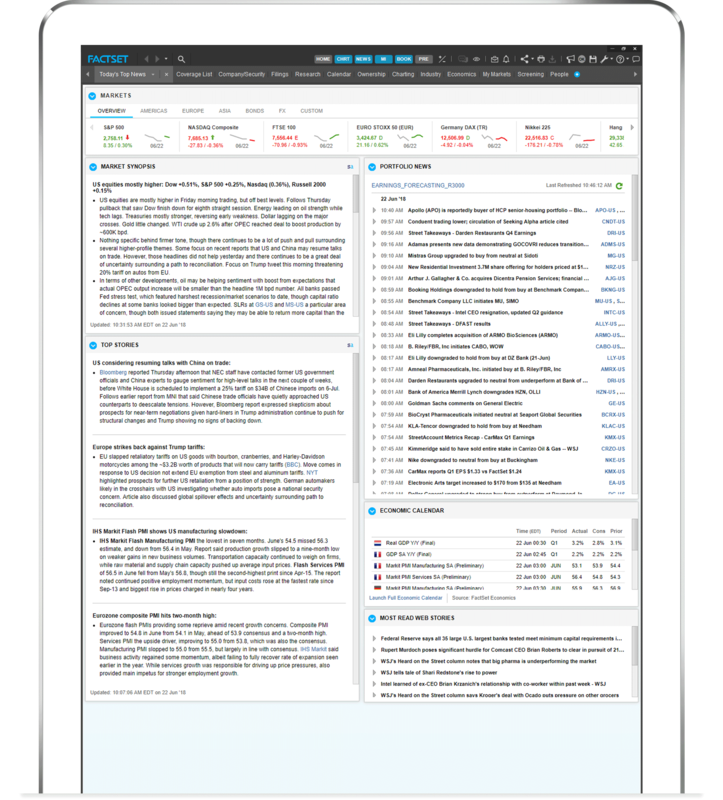 Get real-time news about the companies, industries, and markets you follow with StreetAccount news, access a large library of sell-side reports and notes, and receive commentary and research from FactSet industry experts. Gain instant access to crucial intelligence. Filter out the noise and quickly access relevant, real-time news about the companies and markets you care about with FactSet StreetAccount. StreetAccount scans a wide variety of legitimate news sources to offer comprehensive coverage on global economies and markets. Starting with overnight summary snapshots, you can receive pre-market futures trading updates, pre-market, intraday, after-hours stock trading information, and sector highlights. News and commentary are written in short bullet points that highlight key facts and important information concisely. 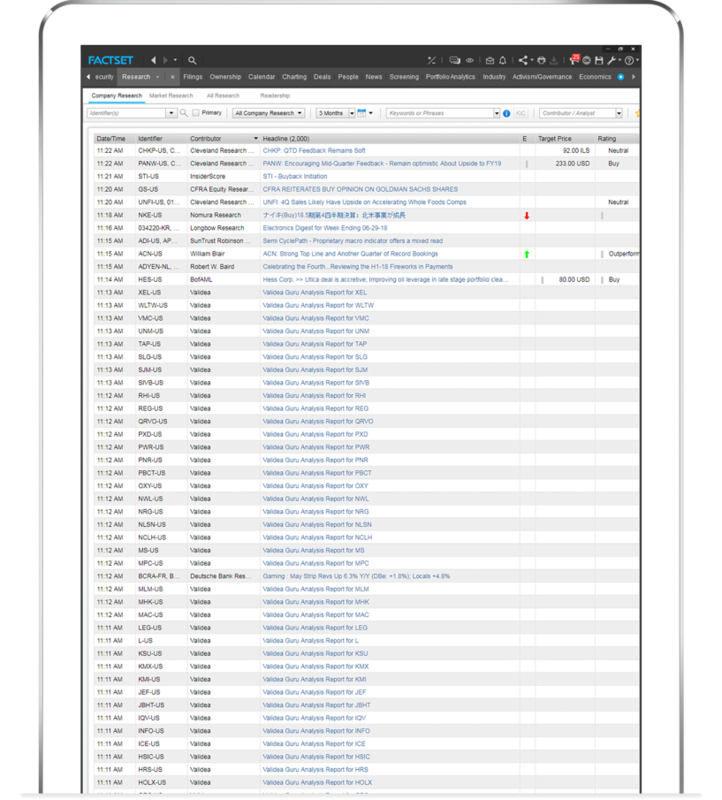 Find the information you need quickly through FactSet or on your mobile device by filtering relevant stories by company, portfolio, index, keyword, or date range, and create alerts to notify you when a story matches your criteria. Get in-depth information on companies and industries. Access sell-side analyst reports and notes from over 1,300 contributors, including investment banks, market research firms, rating agencies, and independent research providers. Our filtering functionality lets you quickly find equity, credit, industry, economics, and strategy reports. You can also quickly locate company reports, initiating coverage, ratings changes, estimates and price target revisions, and models over the past 10 years. Search by the type of research, company, keyword, or analyst, then sort by over 20 industries and regions. Create groupings and sub-groupings to narrow your search and then save it for later. Our robust entitlement system ensures that only authorized users can access reports. FactSet Embargoed Research, also known as aftermarket research, aggregates and delivers research from a wide array of brokers and independent research providers. 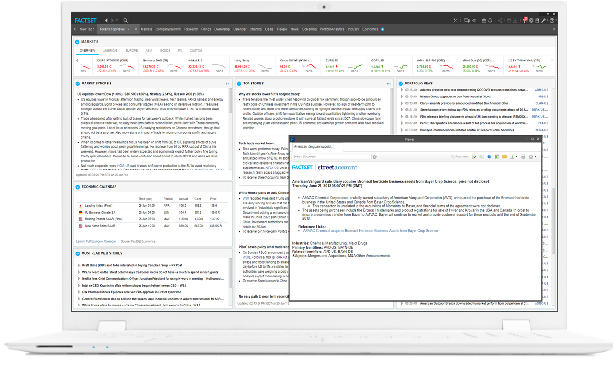 This allows you to search, preview, and purchase research documents directly within FactSet. You can also easily integrate subscription-based research and pay-per-view research. Trust industry-leading commentary that can only come from FactSet. Get in-depth market analysis from FactSet’s industry thought leaders. 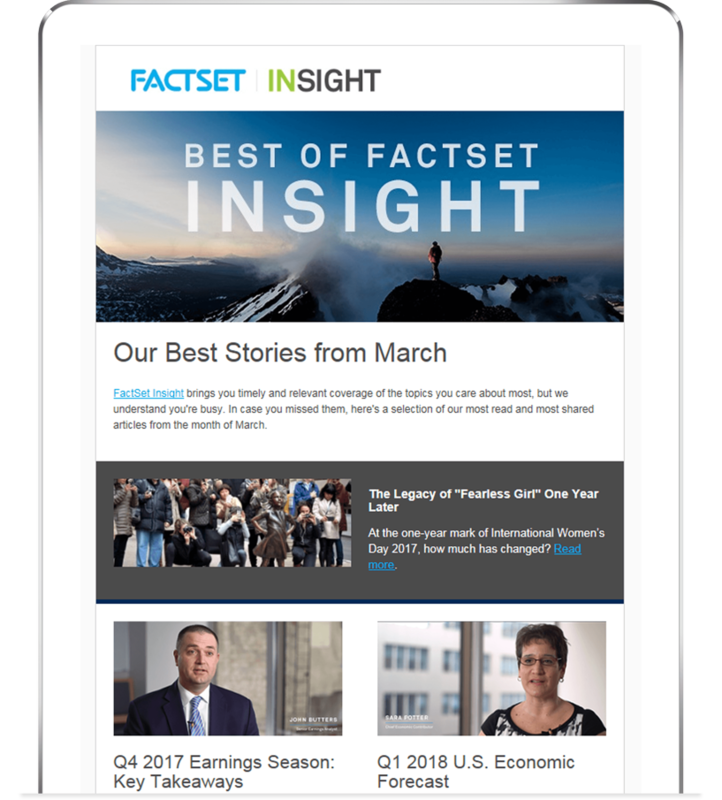 FactSet Insight features unique thought leadership, commentary, and research reports, along with webcasts, infographics, and product news. Our contributors are sourced daily in leading industry media, including The Wall Street Journal, Barron's, CNBC, TheStreet, and more. Get articles like our weekly Earnings Insight, ETF fund flows, as well as deep dives into performance and fixed income analysis, published each business day.